In the last decade, extraction methods and technologies for Cannabis have exploded due to the legalization of Cannabis in states across the nation. This interest has caused extraction experts to look to other industries to learn how to separate the fatty components of Cannabis from the rest of the plant material. Extraction technology has been developing for a long time, with some of the first functional extractors being found in ancient Mesopotamia utilizing a system much like a coffee percolator. Since then, the main principles of extraction have remained, in a way, simple and much the same where a solvent dissolves key components, like tea, and then the solvent is separated, like boiling off the water from the tea. The remaining brown ring after boiling off the water is the extract. In the medical and recreational Cannabis industry, hand-crafting extracts into high quality oils for vaporizing and ‘dabbing’ is the central focus. While the quality of the extracts has increased significantly, the technology for high volume Cannabis extraction has not been explored until lately due to the explosion of hemp production in the US. During the winter of 2014, after the first industrial hemp harvest I began research to develop the optimal methods of hemp extraction. It was quite a ride. I had in mind three main goals. No use of fossil fuels, low energy footprint, and cost effectiveness. I also wanted to find options for farmers to process their crop at a low cost, making this amazing product available for the masses. The first method I used was Ethanol, which produced a relatively good quality extract, but the solvent and energy costs were high, and was not a fossil fuel, it did not produce the desired results of volume and speed. Also a drawback is residual solvent in the final product, and a funny ‘fatty acid ester’ byproduct that I have found extensively in the extracts that forms during processing. For farmers who have only small quantities of product, Ethanol seems like a good potential option. Some of the benefits of ethanol are that you can source it from corn or wheat or other sources of carbohydrates (indeed it can even be made from the leftover leaf material from extraction) and an ethanol setup can be designed and installed on a very small budget, making it ideal for businesses with lower startup costs. Heat carefully and add the hemp, strain and still off the Everclear to keep your remaining bit of extract. 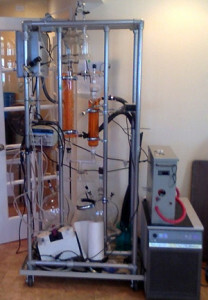 The second stage of research was with what is called a closed loop hydrocarbon extractor. This extraction method was also inexpensive to set up, but uses fossil fuels, almost always contains cancer causing components like benzene, and often there are metal filings and welding debris in the solvent tanks. However, with a bit of skill in equipment design, I believe this type of system holds a lot of promise using alternative ‘green’ solvents. In the fall of 2015 I was able to test a supercritical CO2 extractor. This extractor was able to produce a high quality extract with very high terpene retention, a great color, taste, speed, and selectivity. There are a couple major challenges with CO2, however, aside from the incredibly high overhead and unruly energy consumption, which drive the price of extraction through the roof. The first and probably the most important involves hydrolysis, literally a ‘rotting’ of the fatty acid components through carbonic acid, which forms in response to the moisture content of the extract. Secondly CO2 has a higher selectivity for toxic components than other solvents like Butane or Propane, this means that if you have a plant with pesticides starting out, it can concentrate them even more than an ordinary extraction, which can be dangerous. Critical water extraction is another newer ‘green’ solvent extraction system. This system is ‘green’ with no added solvents but clean water. 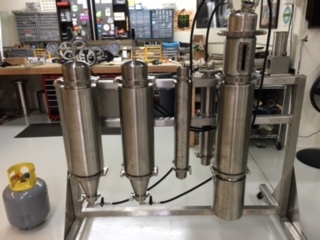 Because of this there is no solvent loss, or cost, and the volume and cost of the extractor makes it a good candidate for industrial hemp extraction. The quality is excellent, terpene content very high, and overhead very, very reasonable. One of the last methods, a truly solvent-less method is sonic and ultrasonic waves, or other methods to create standing waves in the plant matter that push the product out through vibration. This method can also be scaled up, like water extraction on a budget and produces a very nice, high quality extract. Recently, I have been working on a fast, cheap, efficient way to do THC removal from industrial hemp for growers in preparation for extraction. I now travel widely and consult with growers, farmers, and business people in both the recreational/medical cannabis, and industrial hemp spaces, and engage in processing facility setup, product design, planning, and can provide extraction services as this exciting industry grows. Please contact me at rienhavens@gmail.com for questions or feedback.